Probability prevails. We all live in the universe born out of probability. We live in uncertainties. God is, but he plays through probabilities in the creation-game. All games are probabilistic as their outcome is always un-predictive. Einstein failed, while arguing for determinism at the foundation of universe. Niels Bohr won, arguing for uncertainty at the roots. Einstein conceded his defeat. It was a turning point in the history of science. The discipline of Quantum Physics was born. God was happy that man could clear a great road-block of understanding his nature. We now know that God is source and not the cause of creation. The cause came with the emergence of time-space in Him. The God is, and this is-ness alone was God, when nothing existed other than Him. The is-ness alone was truth- the Vedic sat. The only reality which existed in the form of un-manifest existence- which Vedas described as Asat. Meher Baba says in His Parvardigar prayer that He is existence-both the manifest and the un-manifest. The Satya alone is ultimate, and the only reality is the seventh heaven. The Being, the root of all becoming – which are six heavens (plains), are described by Meher Baba in great detail, in ‘The God Speaks’. Yes, the God speaks, but He does so through creation, which Vedas call ‘Vak’ and equate with creation while the Bible calls it the Word. This Is-ness existed in the beginning of creation, in a dark deep sleep unaware of its own existence. It is the state symbolized by sleeping Vishnu in Hindu Puranas. The first to born was ‘will’. But it was free will – not the will, which determines or the one which knew the outcome, but the one which played through possibilities and uncertainties. In Shaiva Tantras this free-will is symbolized by ‘ikar’ of Devanagari script[ it is called will-power. It is the creative power of God. Ahinavagupta, the great teacher of Shaiva tantra, who lived in 900 A.D., says the will-power in itself is expressed in two ways – inactive and active. It is only when the will-power turns active; the consciousness plays its probability game of creation. In “Infinite Intelligence”, Meher Baba says “In the beginning was infinite intelligence, which contained both infinite ignorance as well as infinite intelligence and it is from the infinite ignorance the cosmic existence has been created”. 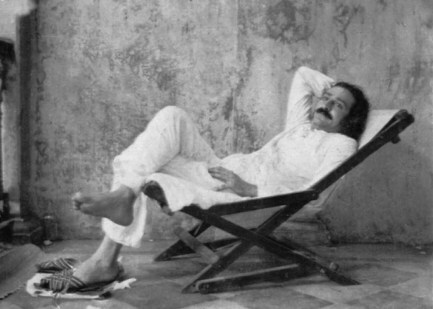 Meher Baba, the ‘Silent Avatar’, has defined infinite existence as- ‘God the reality, the Is-ness, which precedes even existence, but which comes into manifestation and apparent being through the innate capacity to be conscious and think’. He defined infinite mind by two different ways. One though He creates all forms, the infinite mind of Ishwar itself is formless. As such it is incapable of realizing or experiencing its own creation; nor does it experience self. Two infinite intelligence is in the state of thinking; that is the primordial mind, which is the source of all minds- Ishwar, man and all sub-humans. In short God’s journey starts from its original unconsciousness and ends with his self- realization as Shiv- the all knowledge. The probability is the path of self in ignorance. The reality is the path of self in the knowledge. There will be many more Higgs. It will not be the last act of man. Man may acquire the demonic powers. But this will not bring peace to human mind, till we discover the lost light of ours- the light of love. The soul started its journey from darkness to light. The light is the light of knowledge, and the darkness is the darkness of soul. The light is light of one-existence. The darkness, which creates duality, and cuts the ‘one and only existence’ into pieces of conflicting and warring kinds, will never allow man to earn peace for himself and harmony for earth. Let’s pray. Let the light prevail. Let the victory be to God. Let the darkness come to an end. Let we feel towards each other in the light and love of God. Let these payers of Vedic-man of yore see the light of the day. This day, let God be live in our life.